I’m not a huge fan of stickers. I prefer leaving my trail on social media for those interested in my road trips. But more importantly, for me to return to after years and relive the trip through pictures and videos. But the rest of the gang were all excited about these stickers and they kept pasting them in places that we visited. We did made it a point to ask permission first. We didn’t want to be a nuisance and deface public or private property. I was a little surprised to see tourist taxi drivers at Y Junction request us to paste stickers on their vehicles. They wanted to point others to our stickers and tell them that five mental cases from Goa had ridden their motorcycles to Y Junction by riding through snow and ice. One of the drivers pointed to a sticker on his jeep put by Bangalore motorcycle group which had got stranded at Bum La a few months ago. He had been called from Tawang to rescue them. 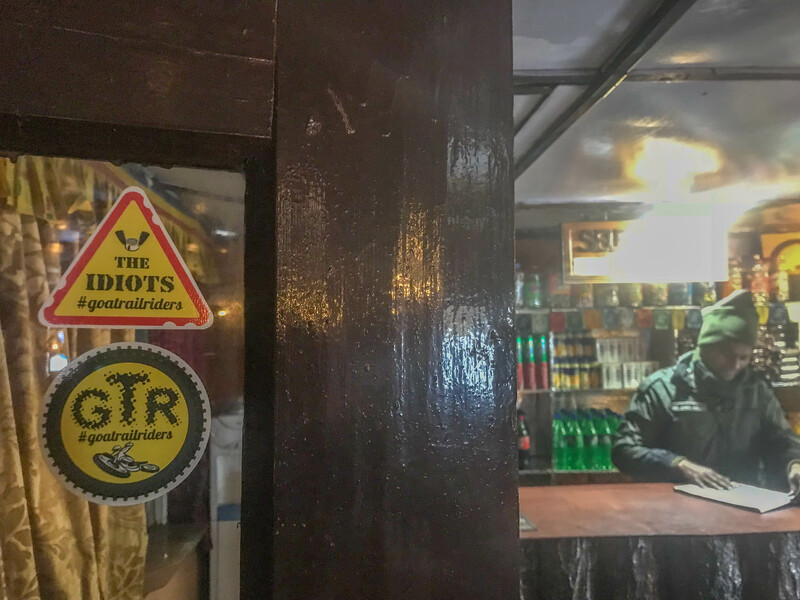 Here are a couple of stickers we put on the Army cafe at Sela Pass.